The latest attempt to correct the U.S.’s failing health is not a White House initiative or even a savvy business plan. Instead, the newest effort is the brainchild of PepsiCo. 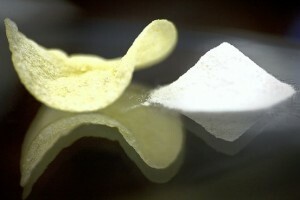 The food industry mogul is in the midst of developing a new salt that will reduce sodium levels by 25 percent or more in Lay’s Classic potato chips, and eventually in its other products, like Cheetos and Quaker bars. The salt—whose crystals are specially shaped and sized to dissolve more efficiently on the tongue—is Pepsi’s proactive step to offer snackers a tasty, better-for-you option. Assuming consumers pick up what Pepsi’s offering, the modified salt could indeed help minimize our national sodium crisis. Currently, the average American consumes about twice the daily recommended serving of sodium—and subsequently suffers from salt-related diseases, like high blood pressure. Cutting salt consumption could lessen the prevalence of such chronic illnesses. This all sounds nice, doesn’t it? But we here in the SRG Culinary Practice are a little skeptical of this super salt. Of course, its purpose is well-founded. Reducing America’s over consumption of anything is a good thing. But why can’t Pepsi take the approach it’s currently taking with Lay’s Sour Cream and Onion? Since the designer salt won’t be released for another two years—and Pepsi has committed to cutting sodium in those chips this year—the company’s simply re-jiggered the Sour Cream and Onion recipe. Substituting natural ingredients and re-proportioning its flavors, Pepsi has already successfully reduced sodium by 25 percent in that popular chip flavor. Ultimately, it will be the consumers that decide if they like Pepsi’s solution. If they do, they’ll enjoy their favorite snacks more salt—and guilt—free. Pepsi will rake in the rewards. And in twenty years, we can reevaluate whether this wonder salt is really as healthy as it seems.